Summer Workshop – Missouri JEA. 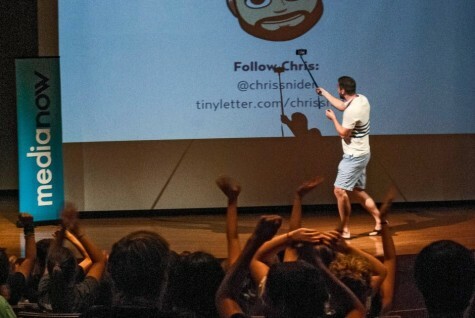 Camp instructor Chris Snider gets campers to pose for a selfie during his morning keynote at Media Now. We are excited to partner with the premiere high school summer journalism workshop in the state of Missouri, Media Now, to annually offer students and advisers the chance to grow their skills and programs through hands-on training from top advisers, college instructors and professional journalists across the country. Media Now provides opportunities for student development and support throughout the year highlighted by a four-day digital media bootcamp in the summer.